This simple bag pattern is not only pretty, but it’s also an easy and mindless pattern to work up. This bag works up pretty quick and easy and is perfect for the summer or any other season. I left mine unlined, but you can line yours for a more durable bag. If you lined it, it would be perfect for carrying your books. Here is a tutorial on how to line a crocheted bag. Also, I made my handles separately for this bag, but you can just as easy use this textured bag pattern as a guide to make the handles a bit different. Click for the Pretty Simple Stitch Tutorial. Finished Size: When laying flat it measures 13.5 across by 13″ from top to bottom. 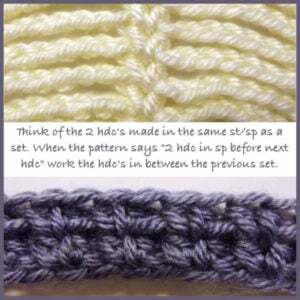 Note: When you work 2 hdc’s into the same stitch or space, think of these as a set. 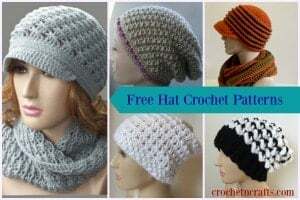 Then when you crochet your next round and the pattern says “2 hdc in sp before next hdc”, work these in between the previous set of hdc’s as pictured. Rnd 9: Ch 1, sk the st where you made the join; work 2 hdc in sp before next hdc, *sk next 2 hdc, 2 hdc in sp before next hdc; rep from * around; join with sl st in first hdc. Rnds 10-42: Rep rnd 9. Rnd 43: Ch 1, (sc, ch 1) in same st as join, *sk next st, (sc, ch 1) in next st; rep from * around; sk last st; join with sl st in first sc. Rnds 44-46: Ch 1, (sc, ch 1) in same sc st as join and into each sc st around; join with sl st in first sc. Rnd 47: Ch 1, sc into same st as join and into each st and into each ch around; join with sl st in first sc. FO. Row 1: Working into the back bumps, sc in 2nd ch from hk and into each ch across. (79 sts) Turn. Row 2: Ch 1, (sc, ch 1) into first st, *sk next st, (sc, ch 1) into next st; rep from * across. (40 sts) Turn. Rows 3-6: Ch 1, (sc, ch 1) into first sc and into each sc across. (40 sts) Turn. Row 7: Ch 1, sc in first st and into each st and ch across. (79 sts) FO leaving a tail long enough for sewing. Attach handles about 2″ from edge on each side. Hello Ilove this bag. how to put linning of this white bag. i love it. i have one more question ,do you sell these bags.